Hear those music notes and polka dots running through your hair! This is a triple layered bow with black red and white colors. 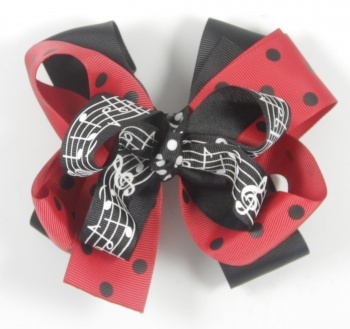 The bottom layer is a 1.5" black grosgrain bow layered with red and black polka dots bow. The top bow is 22 inches long of a 7/8" black with white music notes. The middle is wrapped with a black and white polka dots ribbon into a French knot and attached to a French clip. Get this bow to match just about any outfit!